Airfield Info – Mona Flying Club. RAF Mona Anglesey. For pilots wishing to visit Mona please note PPR is required, also a valid copyof your Insurance with £7.5 million Crown indemnity cover, either mailed to the club before arrival or a copy will be taken when you book in. For overnight stops there is limited hangar space available, although there is plenty of outside parking if required. We have a comfortable clubhouse with tea and coffee available, a fully fitted kitchen and a relaxing lounge area with WIFI for flightplanning. About Mona RAF Mona acts as the Relief Landing Ground for RAF Valley, and is used by student and instructor pilots alike to practice flying airfield circuits. There are only a handful of buildings at Mona now, but, when opened in 1915, Mona was a thriving airship base with, at its peak, 22 hangars and miles of taxi-way around an airfield of an impressive size which included three runways.Due to the sheer numbers of Hawk aircraft operating at RAF Valley, Mona is the very necessary Relief Landing Ground for 4 Flying Training School based at nearby RAF Valley. 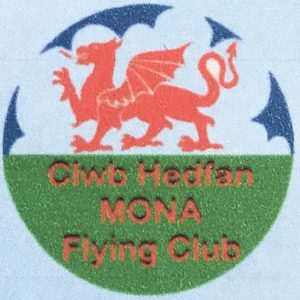 Although Mona is an RAF base it is operated at weekends, bank holidays and mid-week summer evenings by Mona Flying Club which provides full PPL/LAPL training together with Night and IMC ratings plus rating and CoE renewals. Special arrangements can be made in advance to conduct training during midweek days, flying out from Mona and returning later in the day. 04–Right circuits. TORA 1579m; LDA 1524m Tarmac surface. 22–Left circuits . TORA 1579m; LDA 1579m Tarmac surface.